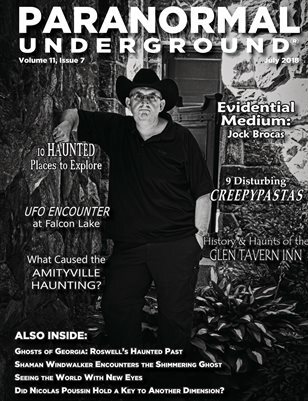 In this issue of “Paranormal Underground” magazine, we spotlight evidential medium Jock Brocas; paranormal fiction writers Judy Clemens and Douglas Robinson; and paranormal fantasy author Danielle Monsch. Also in this issue, don’t miss our coverage discussing if Nicolas Poussin held the key to another dimension and one paranormal enthusiasts ghostly tour in Roswell, Georgia. Plus, read an excerpt from the paranormal nonfiction book “I Have Seen It Tomorrow” by Iris Krst.